Middle school students at Grandview Preparatory School participate in the school’s annual Entrepreneur Fair, using an iPad to display styles of their bow creations. Entrepreneurship is all the rage. Over the last ten years, colleges and universities have been adding entrepreneur classes and programs for both graduate and undergraduate students at warp speed– and now, entrepreneur centers and departments are a staple of higher education programs. And it’s not limited to academia: businesses offer entrepreneurship workshops and trainings, books promising business success line the shelves, and the internet is littered with e-books and whitepapers about becoming a start-up millionaire. At a time when start-ups can lead to businesses worth billions (think Amazon, Apple, and Google) and job creation is a must, K-12 schools must follow suit to teach real-world skills and inspire entrepreneurial thought. In “The Case for Teaching Entrepreneurship in High School,” Businessweek reporter Patrick Clark found that research from the Network for Teaching Entrepreneurship suggests that students who complete entrepreneurship courses do better at educational achievement than the population at large. Even so, it’s no secret that the average American education today stresses rote memorization and test achievement. In an opinion piece for the New York Times, Michael Ellsberg famously asks the question, “Will Dropouts Save America?” Ellsberg argues that American academia does little to prepare students to be entrepreneurs, whose creativity will spark new businesses and create more jobs. “[O]ur current classrooms, geared toward tests on narrowly defined academic subjects, stifle creativity. If a young person happens to retain enough creative spirit to start a business upon graduation, she does so in spite of her schooling, not because of it,” Ellsberg writes. Students in this year’s program created businesses ranging from homemade necklaces and keychains to offering valet services at school. One business even created a brand-new product: a bracelet that repels sea creatures. The students named their product “Shark-X” and even provided video demonstrations showing the effectiveness of the product. Students in all grades, Early Childhood through Grade 12, participate in the Entrepreneur Program. The program begins with planning sessions in which students formulate their business plans (the younger students plan with the help of older “buddies” and teachers) and perfect their products. 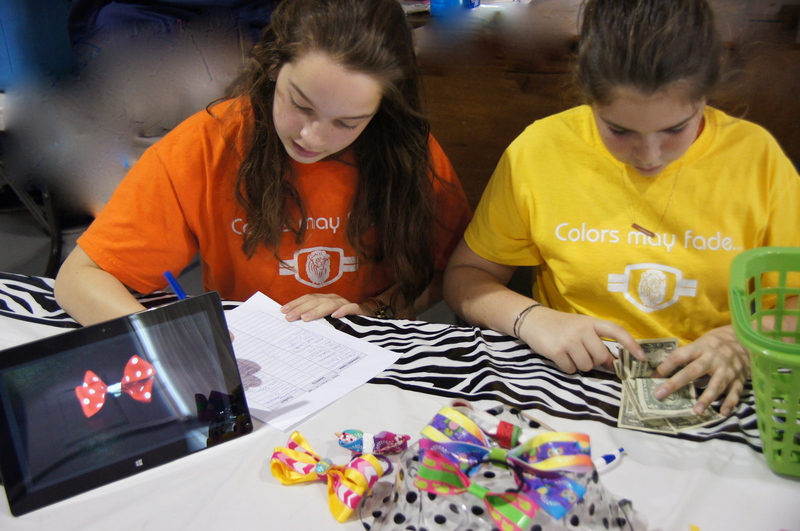 Students then compete for customers at an Entrepreneur Fair– a real marketplace set up at school using real money. Through the successes and failures at the Entrepreneur Fair, students are able to draw connections between their business plans and their outcomes, and they learn that the highest profits don’t always come from selling the most products. Additionally, younger students practice skills in mathematic functions, graphing, and even handwriting. The Entrepreneur Program is one of many methods teachers at Grandview use to infuse real-world learning into the curriculum. Read more about experiential learning in an article about Prideville, Grandview’s small town in action. Tags: Creativity, Critical thinking, Entrepreneurship, Experiential learning. Bookmark the permalink. Agreed…we must foster the young minds that can still “think” about a different way to do things.